A great way to build a relationship with a potential client is to offer a quality and informative white paper. I believe some IT people miss the fact that a white paper is a marketing too not necessarily a technical tool. The example that I provide at the end of this article is informative and guides the reader to your services while being as neutral as possible: This is not a brochure. 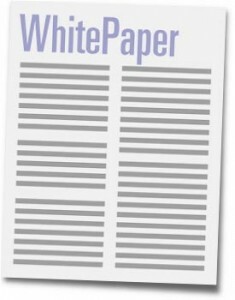 We will discuss what a white paper is and several techniques for marketing utilizing white papers. With a little elbow grease, you can connect with potential clients on an entirely new level than a blog or website article because a white papers is seen at a higher level of information. 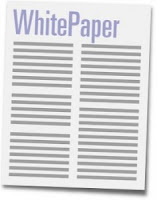 What Is a White Paper, Anyway? White papers vary from a short, single page document to hundreds of pages, but they are generally just an informative, document on a non-fiction topic that is used to inform a person on a specific topic. There is an large degree of creative freedom in how you design and build a document: don't think it has to follow a specific format. You can generate significant goodwill and deep interest in your products and services with white papers. This format of sales material, even though it shouldn't read like a sales piece, gives you nearly completely free reign to present data and verifiable sources that support whatever claims you are making. The key to any marketing campaign using white papers is to make sure you are connecting with the right customers, as not everyone will take the time to read even a few pages of a website for research purposes, much less many pages of a white paper. Giving away a free white paper can be an excellent way to reach a customer who may not have otherwise considered you. Many organizations will publish a white paper and make it freely available to website visitors or email newsletter readers. Readers who would click on a white paper tend to know that they will be opening a multi-page document, so they are generally ready to read at least several hundred words. Giving away a free white paper can be an excellent way to reach a customer who may not have otherwise considered you. Because white papers are designed to be a formal, research-driven product, readers are more likely to accept the claims you make. Providing your white papers free of cost through a website or email campaign can get readers you may not have otherwise been able to reach. An almost free method of marketing your white papers is to ask for a name and email address from the reader who is interested. What makes this process arguably better than a completely free white paper is that the user has to give up something for your information. This makes them more likely to take the white paper seriously since they are now somewhat vested. Two methods are common: (1) fill out the form and download, then (2) get the link in an email. The latter process tends to yield better results since you can be sure that the email address is authentic. Either way nets you an email address and a name you can use for future marketing efforts. A last method is to charge for the white paper. This is typically reserved for extremely rigorous research or white papers that have been published in top journals. While you can charge for a white paper even if it has never been published or peer-reviewed, customers expect exceptional research when paying for white papers. Another reason for a paid white paper is that it contains extremely timely information relevant to an industry. Within 30 days, the white paper price is either reduced or eliminated because the information is no longer as useful. I have written an example that you are free to use and change in any way you feel may benefit your company. It is tailored to a small to medium company in need of help with technology issues.